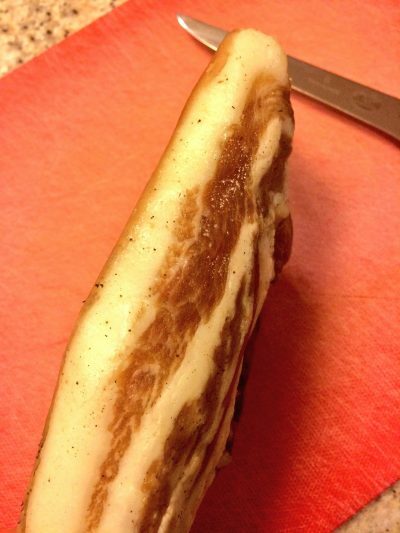 Guanciale (pronounced gwan-chah-leh) means pillow in Italian. 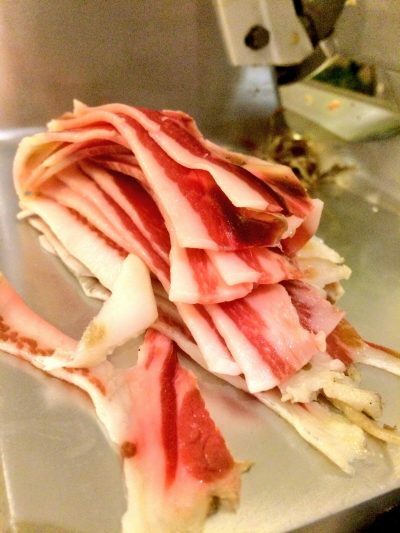 It also means cured pork cheek or jowl. It has a texture and consistency much like bacon but the depth of flavour is much greater. It compares well to pancetta. It can be eaten raw if sliced thinly or it can be cut thick and pan fried to add depth and flavour to many dishes. Make sure that any residual hair is removed from the pig cheeks. Easiest way to do this is with a blow torch or, if you’re brave, using a gas ring on a stove. Grind the peppercorns, juniper berries and bay leaves together. Mix with the salt to form the cure. Sprinkle a layer into a shall plastic box. Add the pig cheeks, and rub in the cure. Sprinkle more cure on the top of the pig cheeks, and again rub in. Place the tray in the fridge for 3 days. Check each day to pour away any liquid that appears. Replace the cure when necessary. 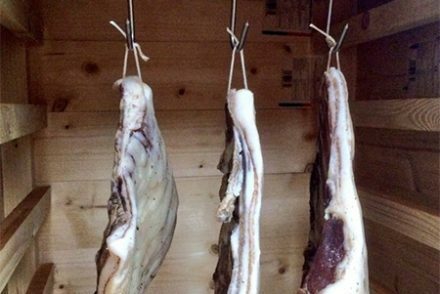 Remove the pig cheeks from the fridge and rinse under cold running water. Pat dry. Use a tea towel for this as paper kitchen towels can leave residue behind. 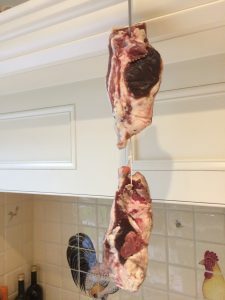 Hang the pig cheeks outside in a draughty location for 3 to 5 weeks. They can then be sliced thinly and eaten raw, or sliced more thickly and used as an ingredient in recipes.